Playground Parachutes is an installation of four large-scale murals by the celebrated New York-based artist Isca Greenfield-Sanders, made in collaboration with over 200 children. 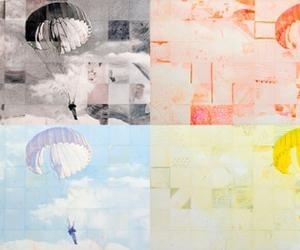 For this community-based, public art project the artist chose a single image from her 2008 parachute series. She gridded the image into 72 square tiles, employing a step in her established technique, and then printed them in the four basic CMYK colors – blue, pink, yellow and black – referring to the importance of the printed image in her work, where at each change interval she returns to scan and print the image. The tiles were then enhanced with colored pencils by young artists at CMA who explored mark making techniques with CMA Teaching Artists. The colored pieces were returned to the artist, who reassembled the composition. Greenfield-Sanders’ artistic process involves pushing and pulling a photographic image through different iterations, changing the color, scale and medium of the work to see how this process alters the end composition. Playground Parachutes continues this conceptual exploration, but removes the hand of the artist, instead including the marks of a diverse group of children, each creating one part of a larger artwork. Each piece can be singled out in the larger composition, with its distinct, individual pencil marks. Yet, when taken with the whole piece, each specific style blends into the overall picture. The artist’s original image, clearly recognizable, is now enhanced with the visions of the many students who added to the tiles. Repetition of the same image is important for Greenfield-Sanders’ disciplined approach to painting, and here the four pallettes render very different outcomes. As the artist explains: “In making images in a four color separation, the blue is seen as full color, it’s how we see every day life. The pink and the yellow don’t have the bounds of a realistic image. And, the black is high contrast, and feels more about landscape and weather.” Consistent with her practice, she is testing the limits of one source image, illustrating how it can be repeatedly used to different ends, here with the aid of children. Greenfield-Sanders has exhibited widely and her work is included in numerous museum collections including Solomon R. Guggenheim Museum, New York; Museum of Fine Arts Houston, Houston; and Victoria and Albert Museum, London. The Brooklyn Museum owns an oil painting from her 2008 parachute series, on which Playground Parachutes is based. In March 2017 Greenfield-Sanders has a solo exhibition opening in New York City at Ameringer | McEnery | Yohe’s Chelsea gallery. This project was realized through the collaboration of three local downtown NYC based nonprofits with Greenfield-Sanders and NYC Parks. The three nonprofits who contributed are GB14, SmartSpaces and CMA. GB14 is a nonprofit dedicated to improving open space in downtown Manhattan. SmartSpaces is a nonprofit that reimagines urban space as venues for public art. CMA is a nonprofit arts facility that brings hands-on art programming to children throughout New York City.